The incident photon-to-current-conversion efficiency (IPCE) of dye-sensitized solar cells depends, amongst others, on the light-harvesting capabilities of the dye. In two recent studies, researchers from the Computational Lab for Hybrid/Organic Photovoltaics of CNR-ISTM Perugia, Italy, demonstrate that spin-orbit coupling (SOC) strongly affects the absorption properties of Os transition metal complexes. 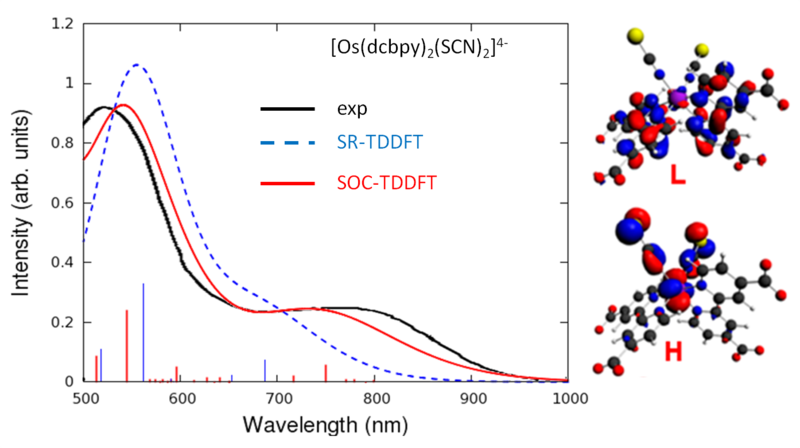 A scalar relativistic approach misses the experimentally observed red / near-infrared features of Os-dyes, which are, however, well reproduced with SOC-TDDFT. While the spectrum of Ru-dyes is much less affected by SOC, their IPCE is nevertheless enhanced by subtle broadening of the low-energy absorption peaks. It is thus argued that a SOC-TDDFT is an extremely useful tool for designing new and efficient sensitizers characterized by enhanced absorption in the red part of the solar spectrum. Comparison of experimental spectrum of [Os(dcbpy)2(SCN)2]4- with SR-TDDFT and SOC-TDDFT calculations.